English Week at the SharePointPodcast with experts interviews recorded at the European SharePoint Conference 2013 in Copenhagen. 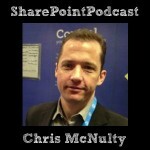 My guest today is Chris McNulty, SharePoint CTO, Dell Software. We’re talking about Dell’s SharePoint strategy, the Dell Social Hub App for SharePoint, the German SharePoint market and more. Dieser Eintrag wurde veröffentlicht in Allgemein, English, English Week, ESPC13, Interview, Podcast, Serien, SharePoint, SharePoint 2013, Social Business und verschlagwortet mit Chris McNulty, dell, Quest, social hub von Michael Greth. Permanenter Link zum Eintrag.